I totally understand that everyone’s definition of what a productive weekend looks like is different. For me, productivity equals getting s*** done that I normally put off! So by those standards, this was definitely a productive weekend. On Friday, I got home from work and started sorting through three loads worth of laundry. It felt good to get that annoying task out of the way. Later in the evening, Vishnu and I headed to Andiamo for date night. Places like this are exactly why people need to get out of South Beach when visiting Miami. Andiamo is an old car wash converted into a pizza joint. Most of the seating is outdoor, and it’s first come first serve. Everything about this place was great – the ambiance, the food, and the service. We will be back! We started with beers. 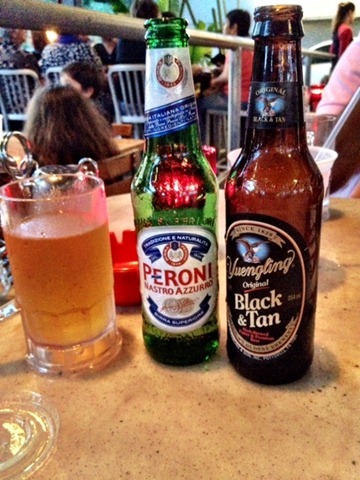 And while I enjoyed my Peroni, Vishnu’s Yuengling Black and Tan surprisingly stole the show. It was dark, velvety, and smooth. I’m not a huge beer person, but this beer is something I can get on board with. Then came our pizza. Our waitress advised us to split a medium so that’s exactly what we did. My half was the Portobello (Portobello mushrooms, caramelized onions, sundried tomatoes, goat cheese, and truffle oil), and Vishnu’s was called the Godfather (sausage, meatballs, pepperoni, and a few different veggies). You guys. This pizza joint is definitely a top 10 place for a reason. The crust was thin, flaky, yet substantial. And the toppings were fresh and used in perfect proportions. I was in heaven! On Saturday, I literally cleaned every nook and cranny of our apartment. Aside from the usual vacuuming and bathroom cleaning, I emptied and reorganized every closet, cabinet, and drawer in our apartment. I know it doesn’t sound like a lot of fun, but I’m definitely someone who likes to cleanse and get rid of things every so often. For three hours, I was in my own little zen zone. Later in the evening I set out to make almond butter…my first time! I followed Brittany’s recipe, and it turned out great. It does take some patience though, as it takes ~15 minutes to get the almonds to a buttery consistency. Now I know it’s not almond butter I don’t like…it’s store bought almond butter. 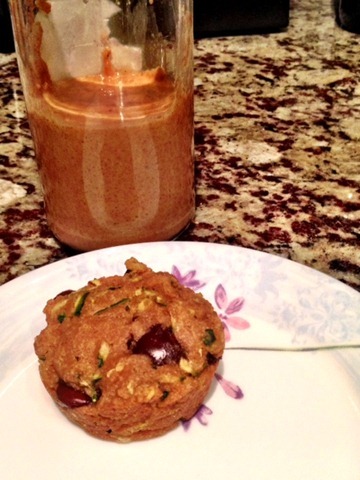 The homemade stuff is good – loved the addition of coconut oil and maple syrup. And finally on Sunday I spent a few hours in the afternoon baking up a storm. My sister is currently in the middle of studying for her medical board exam, and I told her I would send her a bunch of snacks to get her through the next few weeks. 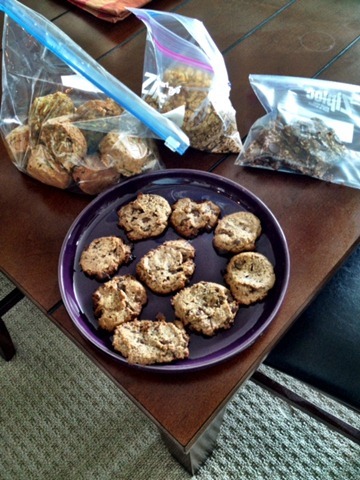 In a few days, my sis will open a package including chocolate chip zucchini muffins, almond meal chocolate chip cookies, maple walnut granola, and protein granola bars. Hope she loves it all! And in true Parita fashion, I ended my productive weekend with a bit of relaxation…coffee with a girlfriend! Hope you had a great weekend doing whatever it is that makes you happy! Sounds like a productive weekend, indeed! Your sister is one lucky girl- so much deliciousness coming her way! My weekend was spent getting set for a few mini getaways (Scotland & Paris) that I have planned, especially in terms of work. It feels good to be ahead of the game and not have to worry about it too much while I’m away! Happy Monday, P! Lucky duck! Those side trips sound like so much fun. 🙂 Can’t wait to read about them! Can I just say I love how you include Vishnu’s eats…my inner meat eater loves it. 3 loads of washing on a FRIDAY night? Come over. I’ll pay you in oatmeal pudding. Haha – I can’t omit my other half! You are such a wonderful sister! If you will adopt me as yours, I will seriously think about going back to college for a 2nd masters just so I can get a package filled with “chocolate chip zucchini muffins, almond meal chocolate chip cookies, maple walnut granola, and protein granola bars” – deal? And if you go back to school, let me know. You’ll get a care package ASAP! almond butter totally takes forever and all 15 minutes you live in fear of breaking your food processor, but it is SO worth it! I really thought my Blendtec was going to fall apart. No such thing happened…thank goodness! Yay for productivity! I am so proud of myself when I can get through 3 errands in a weekend. You have me beat by far! Tara recently posted…Dine On Time Launch! I read your blog! You’re pretty productive! 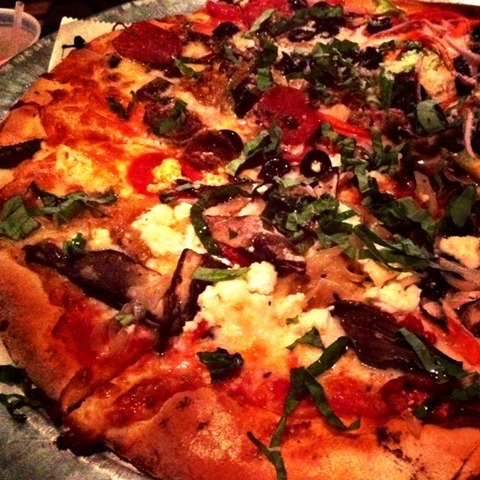 Oh my gosh, that pizza!! Now I’m hungry (what’s new ;)). SO glad the almond butter turned out well for you!